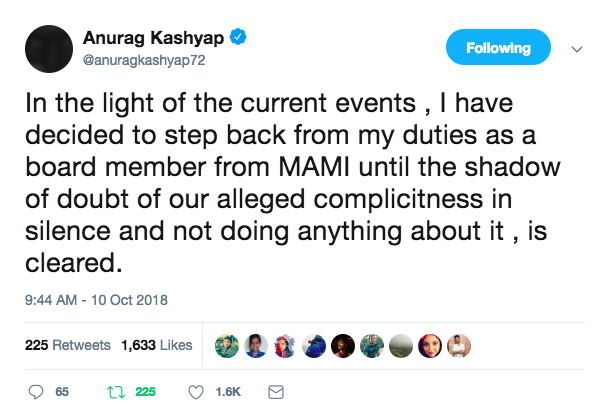 An open letter to MAMI board members questioning their integrity. I was not given an official written statement from the board/committee members as to why my film was dropped. This, inspite of me repeatedly asking for the same. I appreciate the empathy from Team MAMI but it doesn’t change anything. Then why was the film dropped? I understand there are ‘collateral damages’ in a battle but my film is as feminist as this battle we are fighting; and if you’re shutting down a film that starts a conversation against misogyny and patriarchy, then what side of the battle are you on? What side of the movement do you all belong to? Anurag and Vikram clarified their side of the story, shared their dilemma and apologised. But apparently none of this mattered. 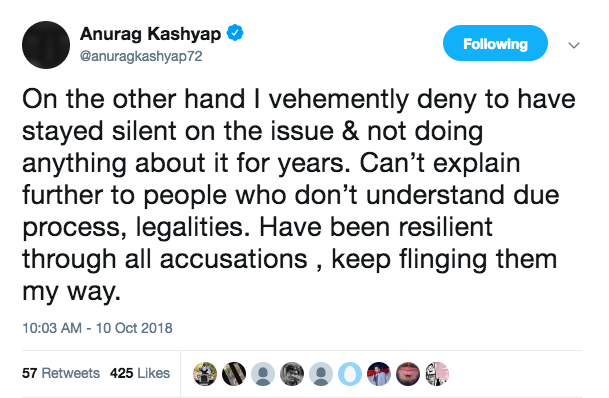 You chose to believe a one-sided, article written by an ‘investigative journalist’ - Ankur Pathak - who kept many details out of the article because it did not suit the narrative of a story he wanted to tell; painting Anurag and Vikram as the wrongdoers, way more than the accused, Vikas Bahl himself! In some personal conversations, Anurag spoke about Vikas and expressed his disgust with the man, said he wanted to take action against the man. He didn’t want his name on Mukkabaaz and later in other films but was bound by the contract. 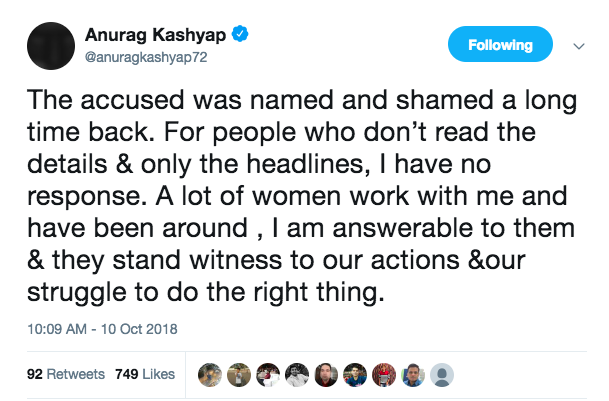 I am a witness to Anurag’s struggle, but since I am an ally, my testimony here doesn’t matter. After the Huffpost article was published, Vikram stood amongst all the employees at Phantom Films and asked us to raise any doubts we had about the case. Without any hesitation, I and other women (and men) threw several questions at him regarding the case and each of those questions were answered. Convincingly. A film produced by Vikram, directed by Atul Mongia has also been removed from your anthology slate. So any film can be rejected or dropped on the basis of past association, whether the accused is involved or not? Today Anurag and Vikram are being punished. As is everyone associated with them. Including their films; our films. And, Vikas Bahl has slapped a defamation case against them. In the meantime, the rest of us have to suffer the wrath against one man. Let’s look at this more objectively. Similarly, MAMI was also supported by Anurag as a Board member. He voluntarily stepped down. So now the short film is sans Anurag’s name and MAMI, the big film festival, doesn’t carry his name either. To apply your very fair analogy, if you still decided to drop the short film for my association with Anurag… shouldn’t you also dissolve the board itself for your association with Anurag? So does MAMI agree to dissolve its board since their own board members are complicit? Or is this only applicable to filmmakers? 1) Satyanshu and Devanshu Singh’s Chintu ka Birthday. 2) Rajat Kapoor’s Kadakh. Director himself accused of assaulting a couple of women. 4) Atul Mongia’s Awake. Producer: Vikramaditya Motwane (partner at Phantom, accused of not taking any action against accused Vikas Bahl). 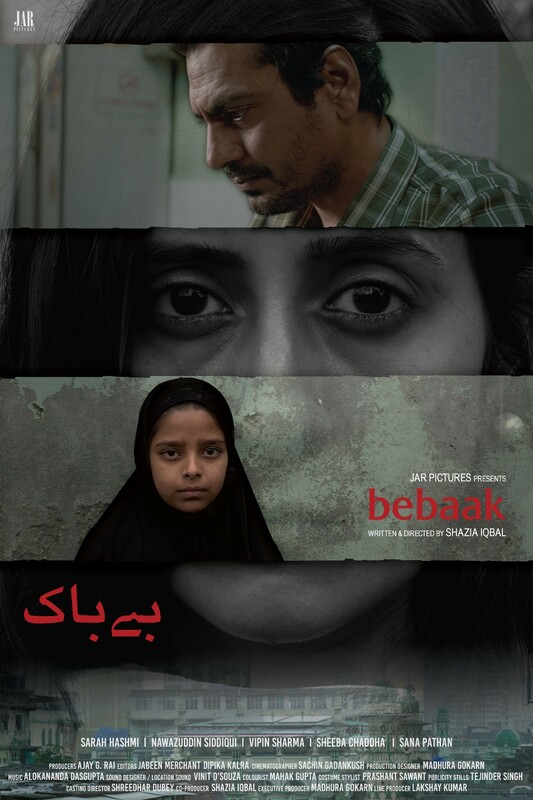 5) My film Bebaak. Producer: Anurag Kashyap (partner at Phantom, accused of not taking any action against accused Vikas Bahl). When Hollywood started the Me Too movement and Kevin Spacey was found guilty of assaulting Anthony Rapp, years ago, Netflix replaced him in The House of Cards. Only him. Spacey was also replaced in Ridley Scott’s All the money in the world. But the show/film wasn’t cancelled. Please tell me which Filmmaker/ Actor in Hollywood or any other film industry has been punished because they are guilty by association. But I guess at MAMI, you want to take a very hard stand on this and punish everyone who is in 100km radius of any accused. This must have required a very strong vetting process. I hoped. But that is not the case. I am also guessing that the MAMI team aren’t fully aware of these films/ incidents mentioned below: (though they are all the over internet and really hard to miss). Lars Von Trier’s The House That Jack Built. 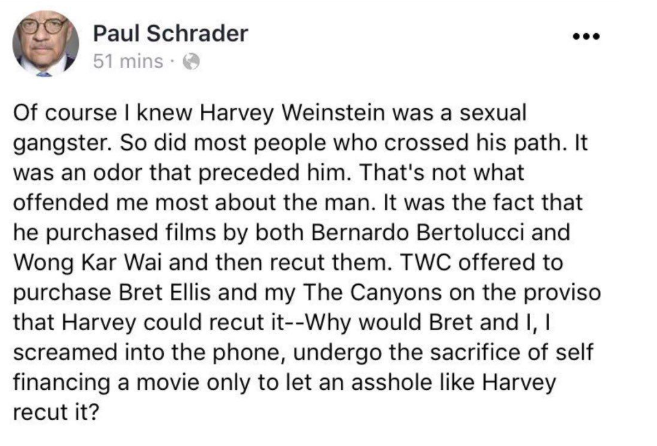 He is directly accused, not a complicit; one of the most powerful filmmakers to be outed during the Me Too movement last year. Singer-Actor Bjork accused him of sexual assault during filming of ‘Dancer in The Dark’. His partner — Peter Aalbæk Jensen — at his company, Zentropa (producers of The house that Jack built) is also accused of sexual misconduct. How is one of Anurag’s film still playing at the festival? Also i was told he is Co-producer on The gold laded sheep and the sacred mountain and financer on Mehsampur. Both are still listed in your programme. I fail to understand why was only a short film dropped? Is MAMI comfortable playing a film by a maker who is more offended by the recutting of films, than sexual assault on women? 4) Nagraj Manjule’s An Essay of The Rain: The news came last year that Nagraj Manjule, the director of powerful films like Fandry and Sairat was accused by his wife of assaulting her physically, emotionally, verbally and she also gave details of how he kept her locked in the house while the family went to collect National Award for Manjule. ‘Female lead and female director is a risk. Aap lead ko change kar ke male kar do’, said one of the Studio heads (they makes family entertainers). ‘Love the idea. Why don’t you give the script to us? We‘ll develop it with another director’. That struggle, that fight was a nightmare. But expected. This struggle, this fight. Unexpected. From the time Me Too movement started in the west, I have felt a silent rage and calm within, at the same time. How badly was this needed! And what an artistic way it has come to finally fight the age old patriarchal, dehumanizing idea of treating women as mere sexual objects. I say artistic because each woman gets a chance to tell her story. Openly. Fearlessly. How powerful is that! As a survivor of child abuse, several sexual assaults and harassment at workplace, I find it really odd, discomforting, unfair and traumatizing to be at the receiving end of the most powerful feminist movement of our times.